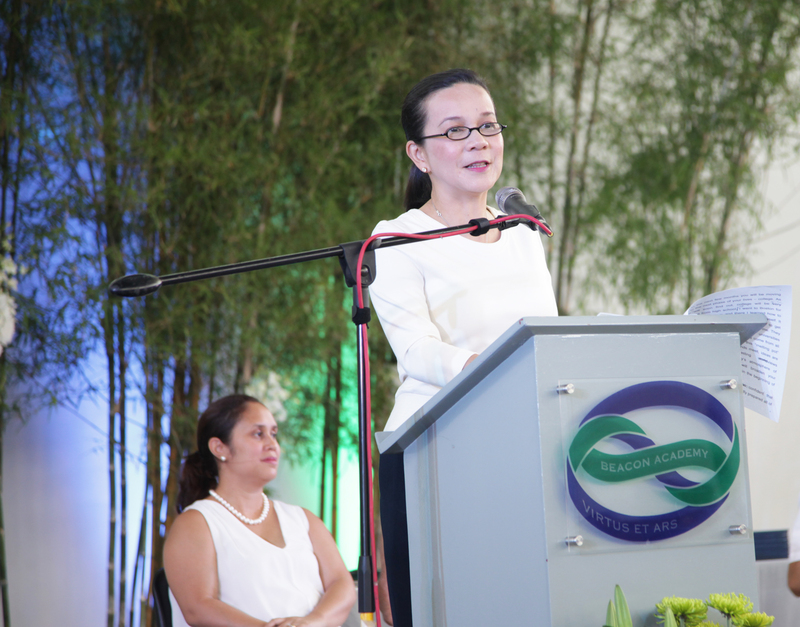 The Beacon Academy was honored to have The Honorable Grace Poe, Senator of the Republic of the Philippines, as our commencement speaker during our third graduation ceremony. Your high school graduation is an important milestone in your life for it marks your entry to adulthood. I do hope that all of you appreciate how lucky you are, for you went to such a fine school that most Filipinos (your age) can only dream of. In the next few months you will be moving on to the next phase of your lives – college. As you will soon find out, college will be very different from high school. I went to Boston for my college degree, and there I learned how to be truly independent and take care of myself. It was also at university where I learned to get along with people vastly different than me. They say that universities are called universities precisely because students there come from all over the “universe.” It is in this “melting pot” environment that young minds meet, ideas are exchanged and contrasting worldviews compete. In the university’s atmosphere of intellectual ferment, you will broaden your horizons and (hopefully) attain the beginning of wisdom. Anyway, I am more than confident that Beacon Academy has sufficiently prepared all of you for the rigors of college life. I should know because my son Brian went to Beacon-Taguig and he just graduated from Ateneo (about two years ago). Brian was a big help during my Senate campaign. He is now working for CNN (as a cub reporter) and also takes time to help out as a Gawad Kalinga volunteer and UP-PGH ambassador. I am happy that he does not only think of himself but is also concerned for our country. I attribute this to his early schooling at Beacon. Beacon Academy has endowed all of you with a world-class education. Use this to better yourself and shine like a beacon for others to follow. So much of what you are today you owe to the people who came before you and the people around you. And by “people around you” I do not only mean your parents, your teachers or your schoolmates. I am also referring to the manong driver who brings you to Beacon every day; to your yayas and helpers who prepare your breakfast and wash your uniform every day; and to the scores of other people whose names you may not know who did you a little favor, extended you a little kindness, and helped you along the way. You are who you are because of them. You should therefore give something back to the community that nurtured you. By giving back, you can make a difference in people’s lives. 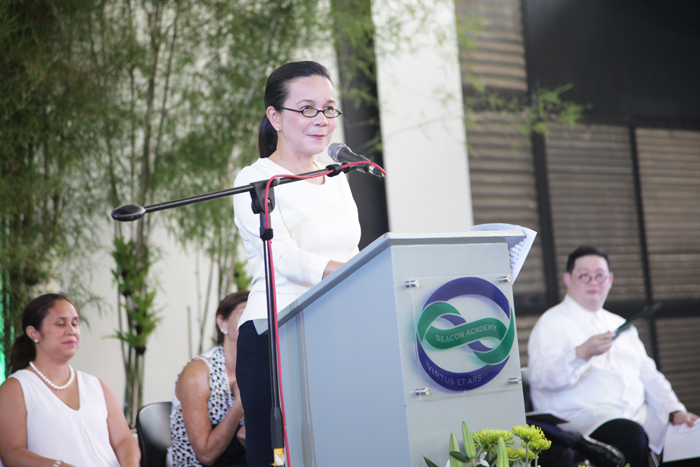 I, for instance, chose the path of public service as my way of giving back to our country. Your high school education gives you an advantage that many people in this country do not have. You can be involved in activities that would improve your neighborhood, your school or your country. Your generation---intelligent, articulate, and tech-savvy--can do much in helping improve your communities. For instance, I presume that all of you are into Facebook, Twitter or Instagram? Perhaps some of you here are already experts in making memes? More than just a medium for sharing pictures, social media is emerging as a powerful media for influencing mindsets and effecting social change. Social networking sites like Facebook and Twitter are being used to empower local communities and to make leaders more accountable to their citizens. In times of calamities and emergencies, social networks are being used to disseminate timely warnings and direct relief efforts. When Typhoon Yolanda hit the Philippines in 2013, it had such devastating effects on Tacloban and nearby provinces. Many were left homeless and lost their loved ones. However, this tragic event also ignited a strong desire in others to reach out and help. Volunteers groups were formed through Facebook, and donations were collected also through social media. During the Haiti earthquake (magnitude 7) which killed 230,000 people, relief organizations set up an online interactive website called Ushahidi (a Swahili word meaning “witness”) where people can send text messages, tweets, photos/videos and information. Ushahidi then processes all these “crowd-sourced” data into a crisis map that showed which areas required immediate assistance and which areas were more or less stabilized. The actor, Ashton Kutcher, used Twitter to fight the deadly disease called malaria. He raised awareness about the disease by tweeting, and informed his followers about how many children had suffered because of it. In other countries, the youth have been active in trying to bring down corrupt politicians or repressive regimes. So my advice to you is: Inform, inspire, enlighten; you will learn much along the way and perhaps discover your role in this world. Start with using tools you are familiar with, like Facebook or Twitter and use them for something more than sharing embarrassing photos. And if you get tired of sitting in front of your computer, go outside. You can for instance become a Gawad Kalinga volunteer and help build houses for the poor; perhaps you can help in a soup kitchen feeding malnourished children in depressed areas; or if you like travelling, maybe you can help plant corals, mangroves and trees in our countryside. There are countless other ways to make a difference. Your only limitation is your imagination. If all of us decide to give something back to our country, I have no doubt that the Philippines will truly become a great nation.